Much has been happening in the studio lately. 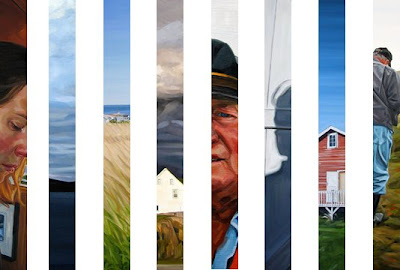 Four paintings have now sold in advance of my Newfoundland Portraits Exhibition in November of 2009! To say I am delighted is a huge understatement. I am finishing my ninth painting for the show, and commissions and other gallery work makes for a rather hectic schedule. Despite the frenetic pace it is important to keep a steady hand and head. I am susceptible to stress and so it is important to stay on task, be disciplined and just get the work done, and done with joy. I was out for a walk today and couldn't wait to get to the studio to paint. Acknowledging how much I enjoy what I do felt wonderful. Sometimes we do work that we have an obligation to do..however to paint what moves you and has no other genesis than from your desire to create something that resonates with you is priceless. When you love what you do that energy is transferred and others can pick up on it. It is as if your mood can be felt when looking at the work. I find this phenomenon fantastic and mysterious, yet not surprising. I have noticed recently that as I have shifted from a focus on the figure to one incorporating more landscape that my desire once again moves to wanting to examine portraiture and the human form. The Newfoundland paintings are exciting to me because they broaden the view to see more of the landscape that these people inhabit. That is the intent. That is the reason why I went there and to challenge oneself is the only way that you can evolve. I suppose it is a form of creative dissonance, wanting to delve into that which you are not focused on. Fortunately people/portraits and the figure occur in 95% of my paintings, so while there is a slight change of course with the landscape, it is not a total departure thematically speaking. I do know that when I move on to a new body of work that it will have a direct concentration back on the figure. To challenge yourself, to take the path less trodden, to TRY new things encourages evolution as a human being and artist. When we try new techniques/subject matter/materials in our work we are growing, learning, testing the waters. 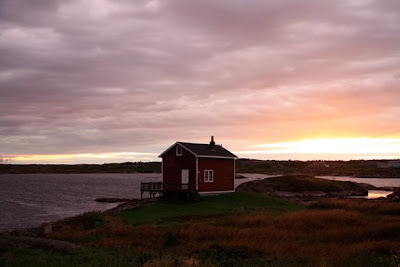 We learn what we DON'T want to do by experimenting with new subjects, cropping, supports, philosophies . This is all a part of the process, and an integral one I believe. If we always painted the same thing, the same way, would we grow and learn and improve? Probably, but not as quickly or as effectively as if we periodically took broad strokes in a different direction. As someone once said "I need to leave in order to appreciate coming home". I believe this is the same principle. 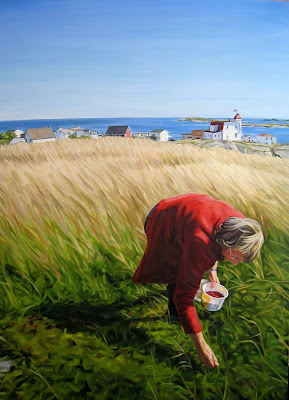 The Berry Picker, Greenspond, oil on panel, 50"x35"
Thus the knowledge that I will once again focus in more on directly painting the figure makes working on these paintings from Newfoundland even more special. They are a finite group, a set amount of visual memories and experiences placed on canvas. With each painting I am transported back to that windswept or fresh, crisp day, purple waters, the smell of the wood stove and mile after mile of unfiltered beauty. I understand why so many people have been moved by Newfoundland. It had pretty big shoes to fill, especially coming on the heels of Alaska but it more than surpassed my expectations. Without the generosity of Abbozzo Gallery and David Blackwood, this journey would not have happened. I am so grateful to them. Here is some information about the exhibition. Please email Abbozzo or myself if you have any questions. I will be giving an artist's talk on November 14th to talk about the paintings. I will post the time of the talk when that is decided upon. Love that ''Berry Picker'' painting, great composition and the red is killer!